The Challenge: Velveeta fans are incredibly loyal. We wanted to give them a voice, let them have some fun and show their pride on National Cheese Day. The Idea: We established the world's first product-sponsored micronation, the Republic of Liquid Gold. Fans could stake their claim and declare their home a piece of one nation, under gold. Sheldon welcomed Velveeta lovers to the site and invited them to stake their claim in the micronation. Each citizen's claim was shown on a worldwide map of claims in the new Republic. 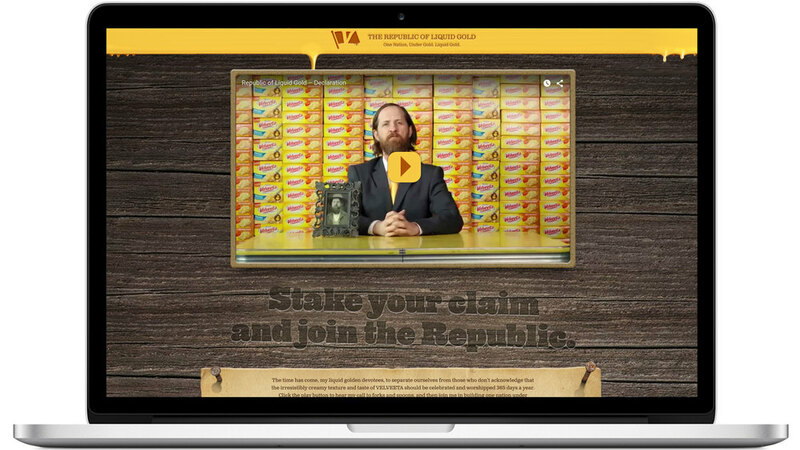 Each new citizen got a certificate of membership, and Velveeta was able to re-target them with advertising about the Republic.